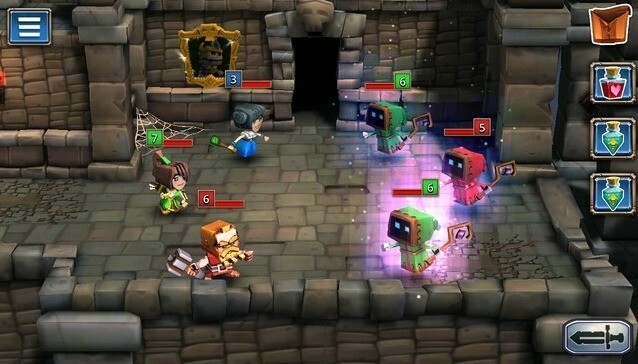 Dungeon Boss is a cute-looking action RPG with a tactical turn-based battle system. The game’s easy to play. Even those who haven’t played a role-playing game before will enjoy exploring dungeons and beating a wide variety of monsters. 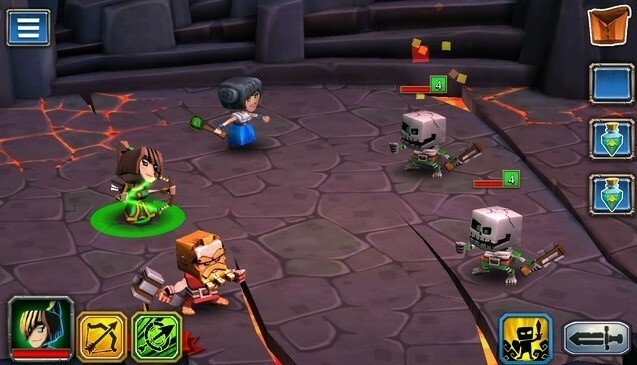 You will fall in love with the adorable 3D papercraft characters and the colorful dungeons. The game also has an assortment of charming heroes, each having a distinct persona and special abilities. You can unlock them by collecting tokens or via the Portal. There are several chapters and each chapter has a unique, ready to be explored dungeon. Tap on “Campaign” and then select a mission. A pop up box will display Drops and Enemies you will encounter in the mission. Note down the enemy type symbol. The tiny symbol can be seen at the bottom left corner of the enemy portrait. Next, tap on the big green button to Choose Your Team. Select those heroes whose type is stronger than the enemy types you just noted down. If you can’t remember the type chart, go back Home and tap on the “Heroes” button. Tap on each unlocked hero and select their “Stats” tab. There you will find a hero’s elemental advantage against an element. In “Choose Your Team”, tap on a hero on the team slot below to remove it. Now select stronger elemental type heroes. If there aren’t any stronger elemental heroes, then choose heroes belonging to the same element as the enemies. Just make sure you team should not have a weaker element. For example, in one mission, there were Fire and Nature heroes. I chose Water and Fire heroes and two Nature Heroes before going to battle. Use XP potions only on those members that you plan to take to battle. This way you can level them up faster and upgrade their abilities. Try to do this before every battle or whenever you get an opportunity. Extra” Check the recommended level before playing a dungeon. It appears just above the “Enemies” section in the dungeon info box before the battle starts. Make sure the player level is higher than the recommended level. This way you will find it much easier to defeat bosses and enemies. “Evos” let you ascend your hero. Ascending a hero will allow him/her to learn new abilities. Tap on a character in “Collection” and select the Ascend tab to find out how many evos are required to complete ascension. Note down the evo type/color that you require and attack it when it appears on the battlefield. An evo appears randomly and can quickly escape if you don’t’ attack and capture it first. So tap on it first whenever you spot one. If you already have enough of those green or red evos, then you may ignore or choose not to attack them. However, having evos of every color and type can be quite an advantage in the future because you will be unlocking heroes as you progress through chapters and maybe the evo you think is of no use can contribute to a new hero’s ascension. There are different types of evos. While some can be captured battling enemies, others can be acquired from Daily Rewards. You might also get them via the Portal. Keep an eye on free summons and you never know what rewards they may have stored for you. A hero’s special ability, once used, cannot be accessed immediately. You will have to wait for a few turns before you can use it again. You can save special abilities for boss levels instead of using them against normal enemies in a mission. When you reach boss stage, use each hero’s ability at the beginning of battle. Your aim is to reduce a villain’s HP as much as possible and using each hero’s ability is a perfect way to do so. Some bosses steal your hero’s HP and may regain health after a few turns. Have at least one hero in your team that can heal other heroes. Use the healing ability of your hero to replenish health of other heroes in the boss level. Try to use the energy potion (costs coins) to recharge your hero abilities in the boss level of a dungeon. XP potions can be earned by completing missions. You get them as rewards. Try not to use an XP potion on a hero whose level gauge is 75 percent (or more) full. The game will also warn you against doing so. You are actually wasting 75 percent of the potion as only 25 percent of it will be used to fill a hero’s level meter. Use that potion on someone whose level gauge is less than 50 percent. Use XP potions on heroes that you wish take with you to battle. Read Tip no. 1 on how to choose a team based on their elemental types before going out to battle. Plan your team and use XP potions on them to level them up. Next, upgrade their abilities, add them to your 4-party team and then start your mission. You gain extra rewards every time you complete a quest. Rewards could be gems, honor, coins, player XP and hero tokens. You can choose any quest you want by tapping on the “Quests” button and choose the quest you want. Tap on the “Travel button to get location hints and try to complete a quest only when all locations are available. Buy potions that can be purchased with coins before heading out for battle. You will find the “Take Some Potions” section in the “Choose Your Team” box. This is where you can select at least 3 items. Tap on an empty slot and then tap on the plus sign below a potion to purchase it. “Heal” and “Energy” potions costs coins whereas the Revive potion costs gems. Having “Heal” potion is a must, followed by the energy potions as it recharges your hero abilities. Revive potion is a bit costly. Use it on a dead hero only when you know the dungeon is quite hard to beat and that the boss can eliminate a team member in just one or two hits. In Dungeon Boss, a hero’s abilities can be upgraded soon after leveling him up. Max out a hero’s ability so that his/her tier can reach the highest point for that level. You may again upgrade abilities when you hero reaches a new level. A hero ability upgraded to the highest tier will make it easier for you to drain enemies and boss’s XP faster. Max out every available ability, including special attacks to make the most out of them in battle. The Heroes button at the bottom of the screen will glow when a new ability upgrade is available or when all tokens/evos have been collected for gaining a star or ascending a hero respectively. A small green gem will appear on a character’s profile, notifying the player that there’s an upgrade or ascend available for him. Make sure you keep an eye on the Heroes button whenever he/she levels up and upgrade their abilities to the highest tier. Poison has little effect on Nature heroes than other heroes. Magical heroes have way more resistance from non-melee attacks like disease, fire and cold. Melee attacks on magical heroes can drain their HP faster. As you progress through levels, you will encounter hard-to-beat bosses and enemies. One reason is that their level or ability tier is higher than your heroes’ levels. Play previously completed levels to level-up your hero. Use XP potions collected as rewards to level them up faster, upgrade and max out abilities to make them more powerful. Beware of Frost apprentices. Their special attacks will stop your hero abilities from recharging for a few turns. You can summon heroes or items for free. Keep an eye on the Portal button at the bottom of the screen. When it glows and a tiny green gem is shown at the top of the button, it indicates that Great or Heroic or both can be accessed for free. You won’t get a hero via these two summons every time. Many times, there will be hero tokens (you will need to complete the token collection to unlock them), potions and other items. Armored characters have high DEF stats, however they can be extremely vulnerable to lightning attacks and drain HP a bit faster if struck by a lightening attack. If you beat a boss in a dungeon without getting your heroes killed, you will receive more rewards. Check out the chest color when you complete a dungeon. If you defeat a boss faster without having your heroes killed by the boss, you may receive a chest of a different color, probably gold or purple. You receive common chests (gray colored chests) if you aren’t too quick or have lost a hero or two while battling a boss.